Thank you very much for that amazing video, in fact thank you for everything that you and the crew did for us throughout the course of the trip and beyond. It was an awesome trip with a great crew and a great bunch of guys. I will definitely do this again... just my 2 cents below for the website. Some pics to share as well. You have come to this website looking for something different! If your quest is an escape from the usual trips filled with tourists and guides amock, trapped in a tour bus or a boat where you are left making introductions such as "Hello my name is **** and I am from ****" look no further, you have come to the right place. This was clearly the best and the most exhilerating vacation I have ever had. My friend Lucas & I, along with 3 other Brits who joined the ride, had an experience of a lifetime. Ours was a 7-day tour called the Roof Ride on Urals that took us to northern Vietnam all along the Chinese border, while we passed through mountains, valleys, waterfalls, windy challenging dirt roads, villages etc. We snaked through local towns and villages while meeting indigenous natives, Hmong tribes to name a few... the kids, and the kids that ran to greet us passing bikers, they are such friendly and welcoming people. I miss the picnic-style afternoon lunches and the rest stops with the local tea and coffee at the roadside shacks followed by the amazing food that was available to us every evening. They took good care of us and even catered for a vegetarian like me, I had no problems finding vegetarian/vegan food in Vietnam as they take pride in their tofu & rice. Explore Indochina is a very professional outfit, structured and they have ride schedules that are met even in inclement weather during the ride. The guides are very knowledgable, well rounded and fluent in Vietnamese so you don't have to resort to hand signals to communicate with locals on the road. The equipment is maintained very well, I couldn't believe that the Urals took everything in stride that we put them through, which was a week of on and off road riding through dirt, mud, water, rain & shine. 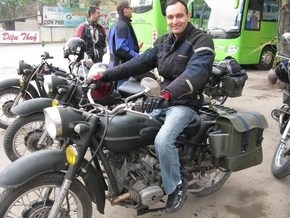 The Urals are very smooth, comfortable and a joy to ride. Having a guide and a mechanic riding along cannot be stressed enough, the mechanics are very informed and know the equipment very well if you needed help. All in all the cost of the ride is very good considering what they have to offer, we never had to dig into our pockets for anything, whether it was extra food or a drink and never once did we feel that we were being short changed. Our guide was absolutely fabulous.